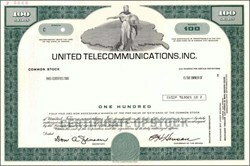 Beautifully engraved and hard to find specimen certificate from the United Telecommunications, Inc. This historic document was printed in 1979 by the Security-Columbian Banknote Company and has an ornate border around it with a vignette of an allegorical woman holding a globe in front of the United States. The certificate has the printed signature of the company's Chairman, P. H. Henson. In 1972, United Utilities changed its name to United Telecommunications. United Telecommunications was also known as United Telecom. In 1992, United Telecommunications adopts the nationally recognized identity of its long distance unit, changing its name to Sprint Corporation. Sprint is a global communications company serving 23 million business and residential customers in more than 70 countries. With more than 80,000 employees worldwide and $23 billion in annual revenues, Sprint is widely recognized for developing, engineering and deploying state-of-the-art network technologies, including the United States' first nationwide all-digital, fiber-optic network. Sprint's award-winning Tier 1 Internet backbone is being extended to key global markets to provide customers with a broad portfolio of scaleable IP products. Sprint's high-capacity, high-speed network gives customers fast, dependable, non-stop access to the vast majority of the world's Internet content. Sprint also operates the largest 100-percent digital, nationwide PCS wireless network in the United States, already serving the majority of the nation's metropolitan areas. Founded in 1899, the company maintains its world headquarters in Kansas City. Sprint is comprised of the FON Group and the PCS Group, representing the company's wireline and wireless businesses. The FON Group represents Sprint's core wireline telecommunications operations, which include long distance voice/data/Internet, international voice and data, local telephone, and product distribution and directory publishing businesses. It also includes activities related to the development of Sprint Integrated On-Demand Network (Sprint ION�), fixed wireless services and certain other ventures. The Sprint PCS Group consists of Sprint's wireless personal communications services operations approaching 100% nationwide PCS coverage.